Thread: Pokerstars Homegames is BACK!! We've restarted out love of poker and restarted our Pokerstars Homegames. We will have an open cash table available 24/7 @ 0.02/0.05 & 0.05/0.10 should you wish more to be made available just let us know! Each Sunday at 8pm we will be running a Bonusbanter Bounty game, small stakes to unwind and blow of the steam of Saturday/Sunday betting! bring along your friends get them to join the homegames club! Entry is $4.05 with a share as bounty & the rest making up the prize pool. Who's all up for it then?? Last edited by BBTipster; 23-02-2018 at 13:21. 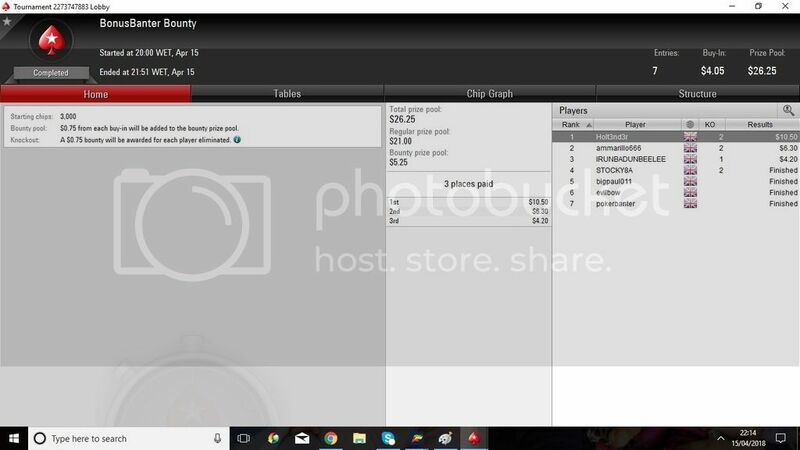 Re: Pokerstars Homegames is BACK!! Well, tonights game saw 6 of us take to the tables & it produced an insane result where the worst player out of all of us won!! But lets not take it away from @hendy27 just because he got dealt all the good cards & even when he didn't he managed to hit crazy outers. Well played Hendy ! And just to mention that NO, this isn't an April fools..... this actually happened! After last weeks crazy result we go again tonight ! Can @hendy27 get lucky twice in a row or will normal service resume with yours truly running away with it with ease? Details on how to join us are in the top post of this thread. All welcome! Last week was April fools week so we were almost expecting a win for @hendy27 but......... & I can't quite believe I am writing this.... ........ he's only gone and won AGAIN!! What is going on? Has @hendy27 turned a new leaf where he actually knows what he is doing ? Can he break the record of 3 wins in a row set by myself? We will find out next week! Well done to @hendy27 on a fine win & for the podium finishers on cashing. Also well done to @EvilAdmin who managed a career best performance of not going out in the first hour! Same time next week guys. Registration open for tonights game. Can @hendy27 do the unthinkable and get super lucky 3 weeks in a row?!?!?! Did anyone grab a screenshot ? Well done to @Holtender on ending the @hendy27 luckfest & finally getting a proper player onto the winners podium! Well done again Holt, see you guys next week! Hendy won last nights game but it was myred in controversy as despite registering, I failed to turn up (done a Procli) but Hendy "forgot" to text me (while stealing all my blinds) until the minute the game was over & he had won. Despicable! Well done on a *fine* win Hendy and I will be there with bells on next week! Congrats to Stocky on a fine win last night with @EvilAdmin & @sef taking home a payday for 2nd & 3rd. It's a first win for Stocky.... will he push on & defend the title next week? Join us & find out... registration already open for next weeks game with details how to join in 1st post in the thread above. Hi chaps, it's been a long time, but it would be lovely to grab a game or two with you fine folk very soon !! Miss the games, some of them were great fun! I only play on PokerStars the now, and usually only late at night. I think the only decent time I would be available would be 10:30/11pm on a tue. How is everyone by the way?? Hey Iain. You're schedule looks tight !! I need to get back into poker but Fortnite has taken over my free time haha. I also tend to lose less money at fortnite. The banter on our poker games was second to none though..... i miss that. Let's get this setup boys and girls ! !